With the growing browser support of some great CSS3 features, you can easily create a folded corner effect. In this article, I will show you an example and give you the references to go further. The inspiration started with this tweet from Harry Roberts. Harry is a consultant front-end architect, known under the nickname of csswizardy. I am a big fan of his work. He wrote some articles that became a reference for the community, for example about writing DRY CSS, about the BEM syntax or about the use of a shame.css stylesheet. The two pseudo-elements of the page are used. I learned, in 2011 (! ), how to create beveled corner with a linear-gradient background thanks to this great article of Lea Verou. 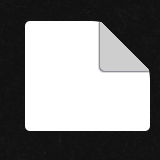 So I wanted to create the same folded corner effect with less constraints by using modern CSS. This code produces a lot of lines without explicit purpose, so it&apos;s better to use it as a mixin. This way, you will be able to group the lines that are needed for the effect and the ones that are just here for the demo. You will also able to customise the effect by using it with your own values. // [Public] Create a page with folded corner effect in CSS. According to caniuse, CSS gradients have almost 80% of browser support. For an effect like this one, which is mainly decorative, I think you can use it. You will have a great code with few constraints on the HTML architecture. Read the article of Lea Verou about how to create beveled corner.